Since a few months, I left the Mac world to making my come back into PC world. I sold my MacBook on eBay and I switch to PC. Nothing new on Mac OS and yes, I find Windows 8 really nice to use. It gets native Hyper-V, improve Windows 7 desktop, Office 2013 and a lot of others things. However, Metro interface is always horrible and even Windows 8 isn’t perfect, it’s definitively nice to use for personal and professional use. After selling my laptop, I had to choose my future new computer. I had several criteria’s for my future new computer. I wanted to customize it by choosing CPU, RAM and hard drive. It’s a portable… so it has to be “portable”. Maybe 13,3’’ or 14’’ with a maximum of 2 kg. It might be portable but comfortable to use without a dual-screen. It would be a personal and professional computer, powerful to be able to play a few games and also to create several virtual machines. I ordered directly on the Lenovo online shop the basis version with 4 GB RAM and 500 GB standard hard drive 5400rpm except for the processor, I took the core i7. I bought separately RAM and hard drive upgrades (SSD). Let’s see how you can upgrade the RAM and the hard drive by your own on the T430. First, remove the battery of your computer and press start button to be sure there is no resilient power in your laptop. 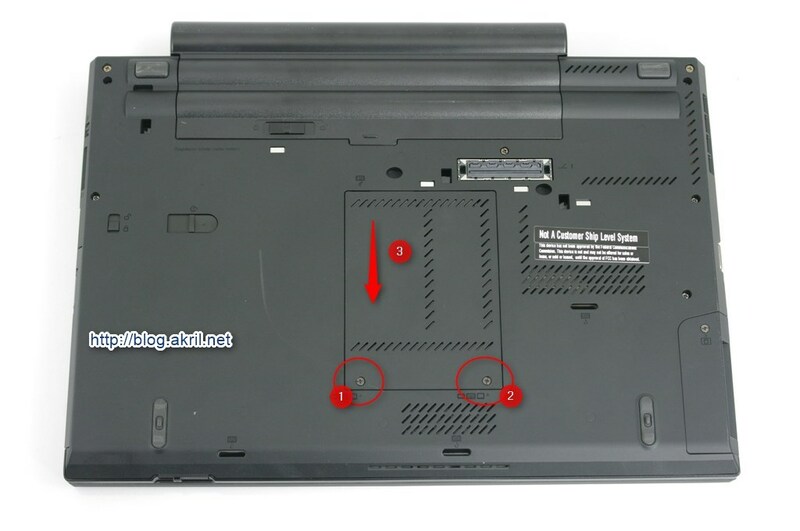 At the back of the laptop, remove the two screws and pull back the trapdoor to access the first RAM slot. 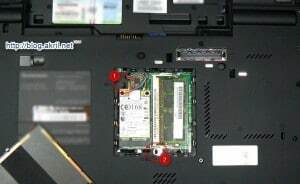 If you have already a RAM inserted remove it and pull yours. Remove the two screws as mention on the previous photo. One at the upper left corner (1) and another one at the middle bottom (2). These 2 screws will release the keyboard. Keep in a safe place the screws and turn back the computer. Now you have to remove the keyboard slowly and gently. You just need to push the keyboard in the direction of the screen. 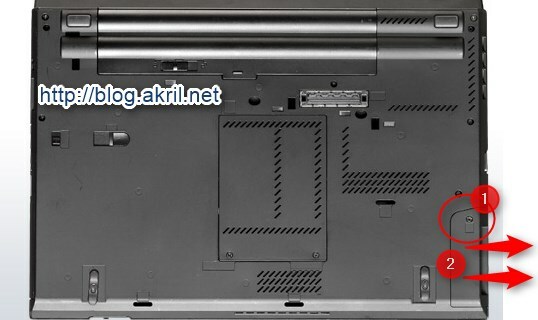 The second slot will be available under the keyboard at the center of the computer. You can’t miss it. Check this video if you want to see the process in action. Big thanks to the original poster. 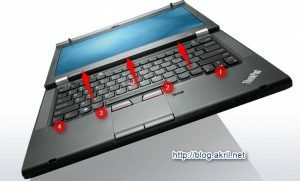 Don’t be rude because the keyboard is connected to the rest of the laptop. You can (as I do) keep the keyboard connected and insert slowly the last RAM bar. For information, the max for T430 is 2x8GB so 16 GB. You can check for compatible memory on Crucial website (for example). To change your hard drive, it’s really easy. You just have to remove one screw. Once you open the trap, there will be a ribbon. Pull on it and the hard drive will come out. Just unscrew the old hard drive, fix your new one and insert back the new hard drive. Really easy but here again, you can check this video to see the process in action. Besides, this second video will also present you how you can remove your optical drive to put a secondary hard drive. Maybe interesting later.